"So you're a priest, who's not an archeologist, sent by the Vatican to investigate an archeological dig that is going to f*** up the Church for the rest of time, and I'm supposed to believe you don't have an agenda?" In analyzing sexual imagery in dreams, Sigmund Freud said sometimes a cigar is just a cigar. Sometimes, what you see is what you get. When it comes to movies, some are just cigars (simple entertainment), and some yearn to be more. Martin Scorcese did it well with The Last Temptation Of Christ. A powerful film that forced the viewer to think, to challenge the tenet's of organized religion and possibly one's personal beliefs, while still presenting a visually effective story, his film was ripe for endless discussions about theological and biblical 'what if' scenarios. The Body wants to be more than a cigar, but it comes up a little short. The premise of director Jonas McCord's The Body seeks to invoke the same type of religious soul searching. A tomb is unearthed in modern day Jerusalem that may or may not contain the skeleton of Christ. If it is Christ, it would appear that he was never resurrected, as told in the Bible, and hence, this discovery could threaten to crumble the foundation of Christianity. A Jesuit priest, Father Matt Guiterrez (Antonio Banderas), is sent by the Vatican to investigate the claim. Guiterrez is told by Church officials to "stop this before it lets loose it's poison". Basically he is asked to prove it is not true, even if it is. Israeli archeologist Sharon Golban (Rushmore's Olivia Williams), who discovered the tomb, is Guiterrez's contact in Jerusalem, and it's their relationship that becomes the focal point of the film. Exploring religion versus archeology, it is the ongoing dialogue between Guiterrez and Golban as they progress from being combative, idealistic opposites, that attempts to bring forward the questions, fears and effects of such a potentially threatening find. Banderas, like his character in The 13th Warrior, is thrust into an unpleasant situation and forced to take control. His portrayal of Guiterrez, a former combat intelligence officer, as quiet and somewhat bumbling, works well. I'm always surprised when I see Banderas in a non-action role, and I'm reminded that he is a good actor. I remember him in Desperado and The Mask Of Zorro, and I tend to overlook the fact that the majority of his roles have been much more subtle. McCord, who wrote the story for the 1993 film, Malice, has made his directorial debut with The Body. He also wrote the screenplay, based on Richard Ben Sapir's novel. The film is cohesive in its storytelling, but it's just not completely engaging. McCord also had the assistance of longtime Brian De Palma cinematographer Vilmos Zsigmond to help create some trademark sweeping visuals, but even Zsigmond's touch cannot totally save this film. Despite the engaging premise, The Body finds little to do with the volatile storyline. This is not a Robert Ludlum conspiracy thriller, with deadly Vatican assassins, nor is it a completely engrossing character study of disparate individuals. 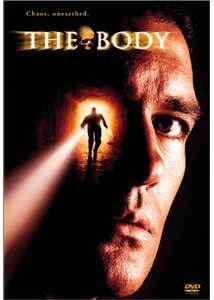 The concept is intriguing, but by the film's midpoint things start to get a bit repetitive and sluggish, and McCord can't seem to decide if he wants The Body to be a thriller or not. A huge point is made that Guiterrez is former military, but little is done with this. The introduction of a scar-faced Palestinian terrorist, with a handful of skinny Vin Diesel-ish henchman, does little to add to the story, and serves only to muck up the ending with an out-of-place action sequence. Image Transfer Review: This is a fairly decent transfer overall. The image is sharp, with minor scanlines and edge enhancement popping up here and there. Fleshtones look consistent, as do the sharp blacks, especially in the flashlight-lit tomb scenes. Colors are bright, with no apparent bleed. This transfer is free of nicks and dirt; however, it is nothing exceptional one way or the other. Audio Transfer Review: Both the 5.1 and 2.0 mix are virtually interchangeable, which is not necessarily a criticism. Minimal surround effects, except for occasional music cues and explosions, leave the rear channels relatively silent throughout. If you're looking for a showcase audio disc to give your system a workout, this would not be it. On the plus side, the dialogue is always anchored solidly, and dominates the transfer, which in a chatty film like The Body, is important. Even with the often thicker-than-normal accent of Banderas, his lines are still clear and intelligible. Extras Review: Extras? What extras? Just trailers for a couple of other Banderas-related films, that's all. This is a spartan release, with nothing in the "extras" department to help The Body. My wishlist might have included some type of theological background information to corroborate or dispute the film's premise. Even a director commentary may shed more light on the experience, and could have given this generally weak film a bit more depth. I wish this could have been a more thought-provoking film, but it falls off the track somewhere early on. This film never quite reaches the drama needed when dealing with the alledged discovery of the skeleton of Christ. Despite presenting some interesting background information on crucifixions and biblical history, it never capitalizes fully on the whole 'is it or isn't it' plot. Banderas is low key and enjoyable, but The Body is stiff.